Fasting – whether we like it or not – is a biblical and spiritual principle. It’s endorsed by Jesus Christ, who fasted himself, while all the major characters in the Bible fasted – Moses, Daniel, Esther, Elijah, Paul and Peter, to name just a few. I’m by no means an expert, but here are some thoughts on about fasting, the Christian principle we all love to hate. 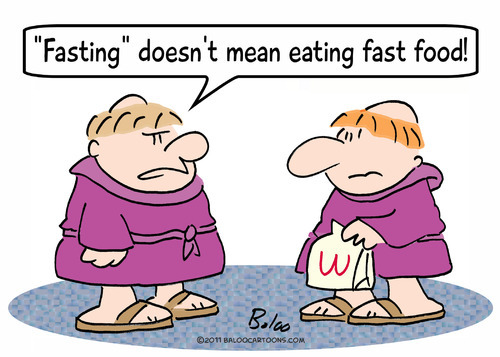 “When you fast,” says Jesus (Matthew 6:16). That’s not an ‘if’ or a ‘maybe’, but a big, fat WHEN. Jesus expects us to fast, there’s really no excuse. The Bible is full of it, so don’t make out that fasting’s not for you. If you’re a serious follower of Jesus Christ, it should be on your agenda. It’s called ‘prayer’ and fasting for a reason – you’re supposed to pray. The classic Christian error is to stop eating for a few days and spend all of your spare time in front of the TV. This is otherwise known as a diet. If you’re serious about fasting, you better be serious about prayer too. They come as a package. It’d be a good idea to step up your devotional time. If you normally pray for 15 minutes per day, why not try 30? If you’re used to reading one chapter of the Bible every night, how about reading two? As you make greater sacrifices, God will see your heart and it’ll become much easier, and more enjoyable. “God loves me more and will answer my prayers because I’ve fasted for three days, right?” Wrong. Sorry to bring you down a peg or two, but your big fast isn’t going to impress God. In fact, fasting isn’t about getting your prayers answered, it’s more about killing your human nature and its desires, submitting to the Holy Spirit and developing a more intimate walk with God. “I can’t fast, I get headaches,” – another classic Christian cliche on the topic of fasting. Well, duh, if you’re going without food for a certain length of time, you will (Shock, horror) get hungry. As you feel your tummy rumbling and images of steak and chicken flash through your brain, just remember why you’re doing it in the first place. Also, 1.5 million children die each year through starvation – I’m sure you’ll survive for a few days. Fasting means no food, no food means headaches, headaches means tiredness, and tiredness means (drum roll) bad moods. I’m sure this won’t apply to you as you’re a wonderful, exemplary saint who lives in perfection, but if you’re anything like me, fasting can make you pretty awful to be around. Just be wary of it, and do your best to snap out of it. When you fast, you’re entering a spiritual battle. The devil hates Christians who fast – they’re serious about Christ and he knows it. Get ready for all manner of temptation, thoughts and circumstances to hit you. But don’t worry, God’s on your side and he won’t let you down. The battle has already been won. I’ve started fasts before and within the first day I’ve found myself at KFC polishing off some finger lickin’ good fried chicken. Does this mean I’m an evil sinner who God hates and is sending to hell? No! We’re all human and we all make mistakes. If you give in and end up breaking your fast earlier than planned, just get back on track at the next opportunity. You haven’t let God down. Fasting is a brilliant tool; it’s submitting your flesh and desires to God and asking him to be more involved in your life. You’ll start to hear his voice clearer, your faith will increase and you’ll find yourself developing a greater hunger for prayer, worship and the Bible. That beats McDonald’s any day of the week, right? Give it a go! I sure wish (southern phrase) that Eve and Adam had fasted. Then I wouldn’t have spent a breath of my life out of His presence. I can’t wait until everyday I spend is with my Savior. Now I know an English chap named Matthew that can’t pass up INANDOUT burgers in California. Breaks a fast every time. Love the blog , can we share it on our website? Don, of course you can. That’d be wonderful. Hope you are well. Good, sensible advice Matthew. What would you say about diabetics, pregnant women, physically fit etc… Or would you draw a hard and fast rule for all? Anth, I’d certainly recommend such people go and see their doctor. I guess we can all make sacrifices – even if it’s not necessarily food. Could I use your fasting blog for prayer and fasting events at ECC Matthew please?